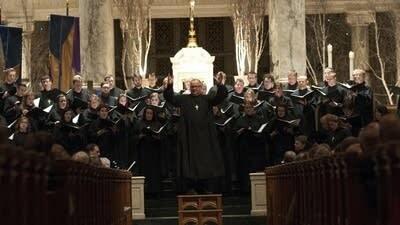 Each year, the National Lutheran Choir fills the Basilica of St. Mary in Minneapolis with the sounds of Christmas. Its 2017 concert is called "No Room." David Cherwien conducts, with guest artists Rachel Brandwein on harp, Sarah Boyle Carmack on oboe, and Gregory Peterson on organ. "The Glory of the Father"
"Thou Didst Leave Thy Thron"